Every marketer or website owner knows what meta tags are, but not all of them realize the importance of these small pieces of code. Optimizing your meta title and description you improve such crucial things as click-through rate and the users’ first impression on your content quality. Although Google doesn’t use meta tags in its ranking algorithms, metadata has an indirect impact on your SERP. How to analyze your existing metadata. As you see, there’s a logical correlation between the metadata you provide and your rankings. So, it’s absolutely worth spending some time to elaborate your meta tags. To make your snippets bring your website ranking a significant profit, they should meet specific requirements. There are two components of metadata you should always consider: title and description. I’ve circled out the tips you should follow when working at each of them. Title tags provide you with great opportunity to engage your potential customers and make them click through to your website. It’s worth to make sure whether they give a precise and accurate summary of your page content. Should contain no more than 65 characters. Search engines cut too long lines. If you want people to see the whole title of your article, make sure its length lets them do it. The most important data should fit the first 50 characters. Place the keywords at the beginning. If you don’t attract users attention from the first words, what are the chances they’ll click through? It should be readable and easy-to-understand. If your brand is recognizable, place its name at the end. Should consist of around 160 characters. The discussion on the perfect length of a meta description seems to be everlasting. At the end of 2017 Google announced they would start showing around 300 characters in description snippets. These were quite significant numbers compared to the previous limits. But in five months, Google claimed they reduced the length to 150-170 characters again. The high volume keywords should stay at the beginning. Denote your competitive advantage. For instance, if you provide free delivery, write it in your description. Call to action (CTA). Such invitations as ‘Find out more,’ ‘Buy now,’ ‘Read here,’ etc. will help you make people visit your page. It should contain a short description of the message of your page content. End it with a full stop or an exclamation mark. Creating your perfect snippet, it’s essential not only to know the crucial requirements but also to be aware of what actions can ruin your ‘first impression’ thing. Try not to use a keyword twice or more. Find the synonyms for your page to get ranked for as much search questions as possible. Never create similar titles for several pages. If your business is new and it’s not that recognizable, don’t mention your brand name. Don’t copy your competitors’ titles. It shouldn’t differ from the content too much. Google analyzes whether your meta description is relevant to the text of the page or not. If search robots decide you try to manipulate and make people click with your description, they’ll penalize your website. Don’t make it too long. The best way to check how your snippet will look like is to enter your meta description into this service. Don’t make it too short. Surprised? If your description contains less than 100 characters, Google can decide not to use it. Search robots used the first sentences from the article instead of using way too short meta description of the page. Don’t use the same description for several snippets. If you can’t create a unique meta description for every page of your website, leave description tag empty. In this case, search engines will use the first lines of your articles to form the snippets. Don’t write it in capitals. IT’S IRRITATING, isn’t it? If you already provided metadata for your pages, it’s time to see whether you did your best or you should change anything. Firstly, look at your competitors’ snippets. Do they add some information your snippets miss? Check what your competitors focus on and think if it could help you improve your click through rate. The results will help you better understand how you can improve your metadata and correct existing mistakes. 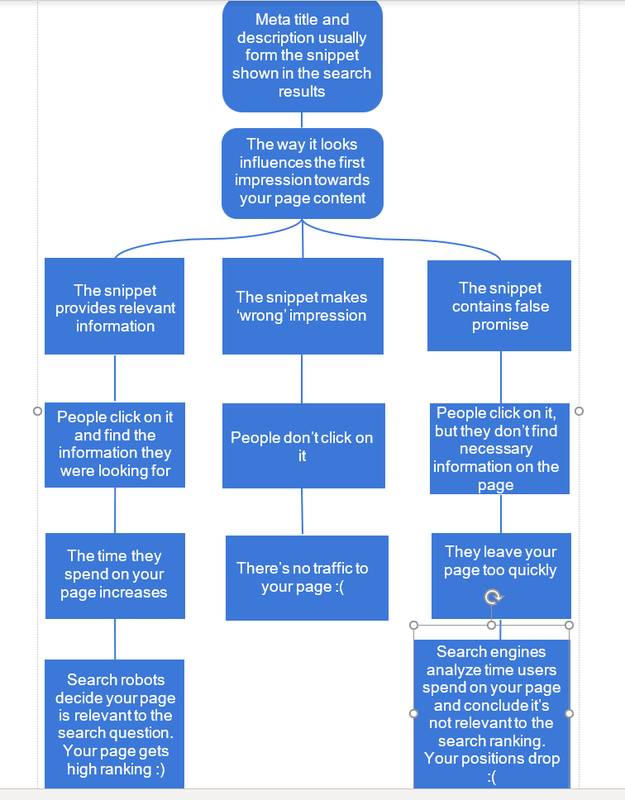 Make people click through (CTA, competitive advantage, etc.). Provide only relevant data about your page content. Inna Yatsyna is a Brand and Community Development Specialist at Serpstat.